Have you received a debt collection letter or being threatened with a CCJ from BW Legal? Do you need advice & help on how deal with BW Legal? Have you received a claim form for a CCJ? Or have they sent you "Notice of Enforcement Action", or "Notice of Issue of Warrant of Control"
We explain who BW Legal are and the steps they use to get a CCJ. We also show you what you can do about it and how you can stop a BW Legal or Lowell CCJ. Last month we helped 898 people deal with BW Legal. Got a letter, claim form or CCJ from BW Legal? Get FREE help NOW to stop them in their tracks. BW Legal are debt recovery law firm. They are regulated by the Solicitors Regulation Authority (SRA) and also the Financial Conduct Authority (FCA) in relation to consumer debt collection. 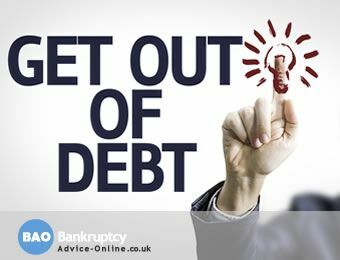 As a debt recovery law firm they specialise in collecting payments of debts owed by individuals or businesses. They enforce debts bought by the debt purchase companies by using the County Court, for example issuing CCJ's on behalf of Lowell Portfolio 1 Ltd.
BW Legal will seek to obtain a County Court Judgement or CCJ for short, then instruct Bailiffs to enforce the claim using a Warrant of Control. When we say they like to get CCJ's, we mean it. They regularly issue 10,000 CCJ's a month and have been known to issue 28,000 County Court Judgements in one month alone. They issue the claim in the County Court Business Centre, and then get it transferred to your local County Court for enforcement. Enforcement can mean Bailiffs visiting your home or business, an attachment of earnings order, a charging order on your property or a statutory demand. If you have been contacted by them, you have to make a decision on how to deal with them, because it is not going to go away unless you deal with it. Whilst BW Legal have a process to go through to get a CCJ against you, no matter where you are up to in that process it is important that you take advice on how to deal with it. The earlier in the process the easier it is to stop. Whether you are at Step 1 or Step 5, we can help you deal with and overcome a CCJ from Lowell Portfolio 1 or BW Legal. Step 1: Claim Form from the County Court Business Centre. Step 2: Judgement for Claimant (in default) from the County Court. Step 3: Notice of Enforcement Action Letter from BW Legal. Step 4: County Court Bailiff Instructed Letter from BW Legal. 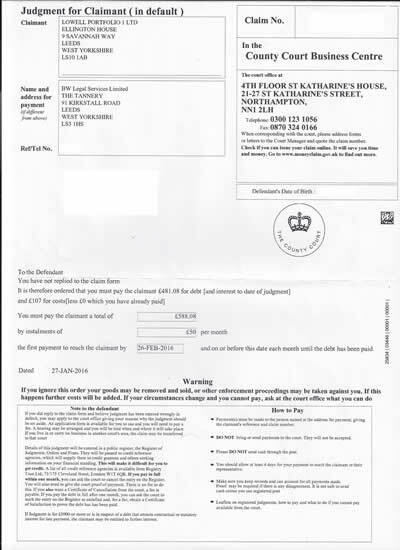 Step 5: Notice of Issue of Warrant of Control from Bailiff. The first step BW Legal take to get a CCJ is to issue a claim through the County Court Business Centre. You will get a brown A5 envelope through the post containing the claim forms and defence pack from the Court Office at 4th Floor, St Katharines House, 21-27 St Katharines Street, Northampton, NN1 2LH. 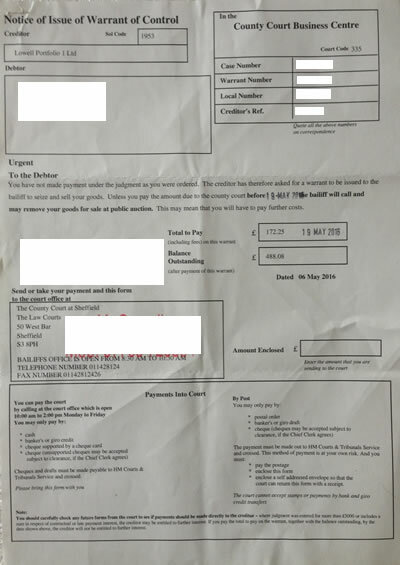 Below is an example of a BW Legal Claim Form, issued on behalf of Lowell Portfolio 1 Ltd.
As you can see in the above photo of the BW Legal and Lowell CCJ Claim Form, they will have added interest, the court fee and legal costs. So the debt is now increasing on a daily basis. If you admit the debt, you will need to complete the N1 and N9A and return them within 16 days. It’s a good idea to send it recorded delivery to make sure it arrives. It’s important that you complete all of the sections fully and make an offer of payment based on your income and expenditure. We can help you to do this. Got a claim form or CCJ from BW Legal? Get FREE help NOW to deal with a CCJ or Warrant of Control. Once you get a letter titled ‘Judgement for Claimant’ from the County Court it means the CCJ is registered. This will be recorded on your credit file for 6 years, unless you pay it in full within one month of the date of the judgement, in which case you can ask the court to cancel the entry on the Register. Below is an example of a Judgment for Claimant (in default), issued on behalf of Lowell Portfolio 1 Ltd.
As you can see the debt has increased from Step 1 when it was £566, to £588 after the judgement in default letter. If you did not reply to the claim form and believe the judgement has been entered wrongly in default, you can apply to the court asking for the judgement to be set aside. If you have received a Judgement for Claimant letter from the Court you need to get advice from us quickly, as enforcement action will not be far away unless you pay the debt. Now BW Legal are turning up the heat and racking up the amount you owe! 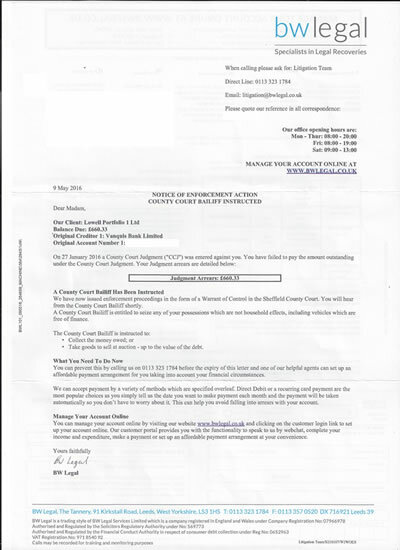 This letter will arrive from BW Legal on their letter headed paper, rather than being sent by the county court. It will be titled "Notice of Enforcement Action Councy Court Bailiff Instructed"
It will basically state that they have transferred the CCJ to your local county court, got a warrant of control and that the your local County Court Bailiff will visit your home to seize any possessions (which are not household effects) to sell at auction, in order to pay your debt. The amount owed will also have increased, in this case the debt has increased from £566 in Step 1 to £660 in Step 3. This is due to BW Legal adding interest and charges to the debt. Below is an copy of Notice of Enforcement Action Letter from BW Legal. Got a CCJ from BW Legal? Get FREE help NOW to stop the Bailiffs. Once BW Legal have written with the notice of enforcement action, they will instruct the County Court Bailiffs to collect the debt. 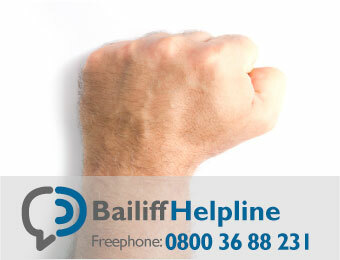 The Bailiff will not give you warning that they are attending your home to collect what you owe. If you do owe the money, then even at this stage it is still not too late to negotiate with BW Legal. If you don't owe the money, and have not replied to the Court, then you need to act quickly. Either way you need to get some FREE advice from us, before the Bailiff comes knocking. This is the final warning from the County Court that Bailiffs will be attending your property, and is sent from the Court not from BW Legal. It will give a date by which the debt must be settled. It will usually contain the Bailiffs contact details, asking you to call them to pay. Below is a photo of a Notice of Issue of Warrant of Control, stating the bailiff will call and may remove your goods for sale at public auction. If you have received a Notice of Issue of Warrant of Control you need to contact us immediately. Received a Warrant of Control Notice? Need help with BW Legal or Lowell?